Companies have until 25th May, 2018 to become GDPR compliant, and while the new regulation removes much of the existing complexity in the area of Data Protection, the regime itself will be much stricter, with action required by companies to ensure operational compliance by the deadline. Under European Parliament, GDPR will protect personal data for all individuals within the European Union (EU), this includes the export of personal data outside of the EU. Personal data can be anything relating to an individual within their private, personal, or public life including names, photos, posts on social media sites, or a computer’s IP address. How can Companies prepare for GDPR? With ten chapters, ninety-nine articles and one hundred and sixty requirements, the EU GDPR is no simplex law, and here at CG Business Consulting, we acknowledge that implementing the right processes and organisational changes to secure compliance will not be an easy task. Which is why we have stepped into the GDPR breach. We want to help our clients overcome as many of the initial challenges as possible, so we’ve pulled together a step by step guide or ‘how-to’, to help you get organised. 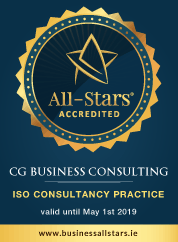 If you need help on how and when to create a DPIA – Data Protection Impact Analysis – which approval processes should be put in place, what governance model to apply, and what the role of a DPO – Data Protection Officer – is in the context of EU GDPR, we at CG Business Consulting can help you out. Interested in our GDPR Tool? GDPReady is an easy-to-use assessment tool, helping you to track your organisation’s compliance against the many different requirements of the GDPR regulation.